Quarterly US utility-scale solar PV installations fell below 1 gigawatt (GW) in the third quarter for the first time since 2015 due to the impact of the Section 201 tariffs imposed at the beginning of the year and the uncertainty which surrounded their potential introduction, according to the latest US Solar Market Insight Report from Wood Mackenzie Power & Renewables and the Solar Energy Industries Association (SEIA). In total, third quarter US solar installations hit 1.7 GW, a drop of 15% from the same quarter a year earlier and 20% down on the second quarter of 2018. This included 678 megawatts (MW) worth of utility-scale solar installed through the third quarter — revealing the impact of the Section 201 tariffs on imported solar cells and modules imposed by US President Donald Trump in January. A further 581 MW of residential solar was installed in the third quarter, reflecting the continued stabilization of the sector as growth for both a year-over-year and quarter-over-quarter was relatively flat. Finally, the US installed a total of 492 MW of non-residential solar PV in the third quarter, up 6% from the second quarter but down 6% from the third quarter of 2017. All in all, then — thanks primarily to the impact on the utility-scale sector by the Section 201 tariffs — the US solar market was down 15% year-over-year, but Wood Mackenzie and the SEIA expect a strong project pipeline, which augurs good news ahead. While the utility-scale segment took the brunt of the Section 201 tariff, the residential segment was content enough to simply continue stabilizing, remaining relatively flat for the third quarter in a row. More importantly, however, is the expected capacity additions, especially in the tariff-stricken utility segment. 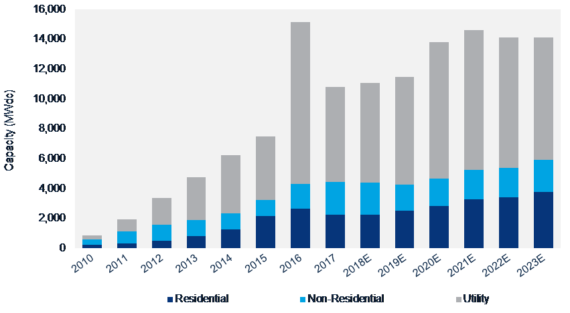 Specifically, Wood Mackenzie analysts currently expect 3.5 GW worth of utility PV to be installed in the fourth quarter — making it potentially the largest quarter for utility PV installations since the fourth quarter of 2016. According to the authors of the report, many projects which have been on hold through the early part of the year due to the uncertainty surrounding the implementation and impact of the Section 201 tariffs are now expected to come online in the last quarter of the year. 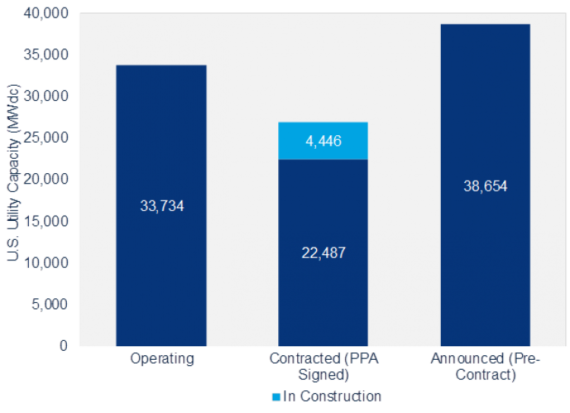 Further, utility-scale procurement has expanded dramatically despite the looming threat of the Section 201 tariff uncertainty, and Wood Mackenzie has recorded 11.2 GW worth of projects announced so far this year. But, this is an expectation for the long-term, and Wood Mackenzie expects 11.1 GW of new solar to be installed in 2018, while total US solar PV capacity is expected to more than double over the next five years, and by 2023 over 14 GW of solar PV will be being installed each year.